The Mulgrave Heritage Centre is a long-overdue addition to the mainland side of the Strait of Canso. In 2001 the Mulgrave Museum & Cenotaph Committee formed and soon recognized the need to capture and expand on the town’s rich connection to the sea as a former transportation link and the center of the fisheries industry before 1955. 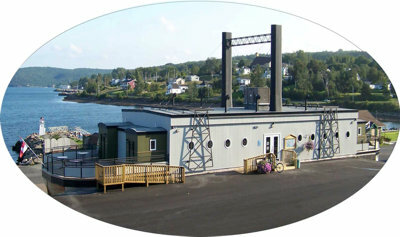 The newly-completed Heritage Centre, a replica of the Scotia II train ferry, is the focal point through which the rich and varied history of the town is communicated. The eastern extension of the Inter-Colonial Railway between New Glasgow and Mulgrave was completed in 1882, with the S.S. Scotia and later the S.S. Scotia II providing the only link between the mainland and Cape Breton for rail cars. During the railway era Mulgrave enjoyed great prosperity and served as a central business place for the Strait of Canso area and beyond. After completion of the Canso Causeway in 1955, the termination of rail service to and from the Mulgrave area severely diminished the social and economic life of the community. On July 1, 1926 the Province of Nova Scotia began to operate its own automobile and passenger ferries between Mulgrave and Port Hawkesbury. The first of these ferries was the Pointe de Canseau which was capable of carrying 10 cars. The Charles Tupper which came into service in 1928 was capable of carrying 18 automobiles. The John Cabot and the George H. Murray served this route until the termination of all service in 1955. The railway roundhouse building was built at the southern end of Mulgrave in a community known as Pirate Harbour. The Roundhouse accommodated train engines needing repair while the mechanical turntable, located in front of the Roundhouse, rotated the engines, making possible the shunting of trains into the rail yard on the CNR wharf at Mulgrave. Some of the freight would be off-loaded at Mulgrave while other items were loaded on the Scotia train ferry for transport across the Strait of Canso to Point Tupper. From there goods would travel to other destinations on Cape Breton. Built during Confederation year, this school served the educational needs of students living in the “upper town” section of Mulgrave. It was named by student Alphonse O’Neil in honour of Colin McNair and family, one of the first families to settle in Mulgrave. The school closed in 1952 after 85 years of continuous operation. Subsequently the new Mulgrave Memorial School was opened for all students in the town of Mulgrave. The building was removed in 1988. The first church built in Mulgrave in 1847 was St. Andrew’s Anglican. It is said that the land was donated by James B. Hadley, a member of the church and Post Master at Mulgrave. The Anglican cemetery on Church Street continues to be used by St. Andrew’s Church. The VIC is located in the new Mulgrave Heritage Centre building at 54 Loggie Street across from the Mulgrave Marina. From June to September there is full-time staff to answer tourists’ questions and provide them with an abundance of information on any place in Nova Scotia with links to the other Maritime Provinces.